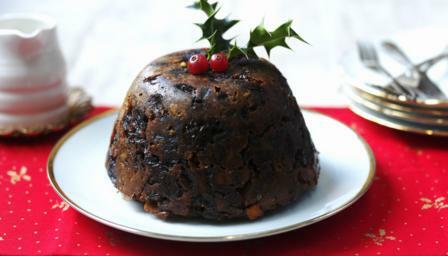 The Traditional British Christmas Pudding, often called a plum pudding although there are no plums, fresh or dried, in the pudding. Serving adorned with a sprig of holly is traditional. Today is last Sunday of the church year, the Sunday before the start of Advent, and Stir-Up Sunday. Stir-up Sunday is the traditional day for everyone in the family to take a turn at stirring the Christmas pudding and making a wish. Christmas puddings were always made at home and they were made a month before Christmas so the flavours had plenty of time to develop before Christmas. The name 'Stir Up Sunday' comes from the opening words of the prayer for the day in the Book of Common Prayer of 1549 and later. A proper Christmas pudding is always stirred from East to West in honour of the three Wise Men who visited the baby Jesus. I will be making my Grandmother Young's Christmas Scotch Cake. I had not known about the traditional 13 ingredients until today but when I checked her recipe- you guessed it-13 ingredients! Normally Grandma baked her Christmas pudding in loaf pans in the oven. This year, in honor of being in England, I will do it the traditional way and steam it for 4-6 hours. I will also be making and steaming a Fig Pudding that comes from Mike's family. He remembers his Grandmother O'Neill making it. Years later his Aunt Evelyn and I tweaked the recipe somewhat to make it better for your cholesterol count. I plan on making Aunt E's version unless the need for tradition overtakes me at the last minute. :) BTW it only has 10 ingredients. I have not included either recipe so as to save space and not bore you too much. :) If you are interested just let me know and I will share.